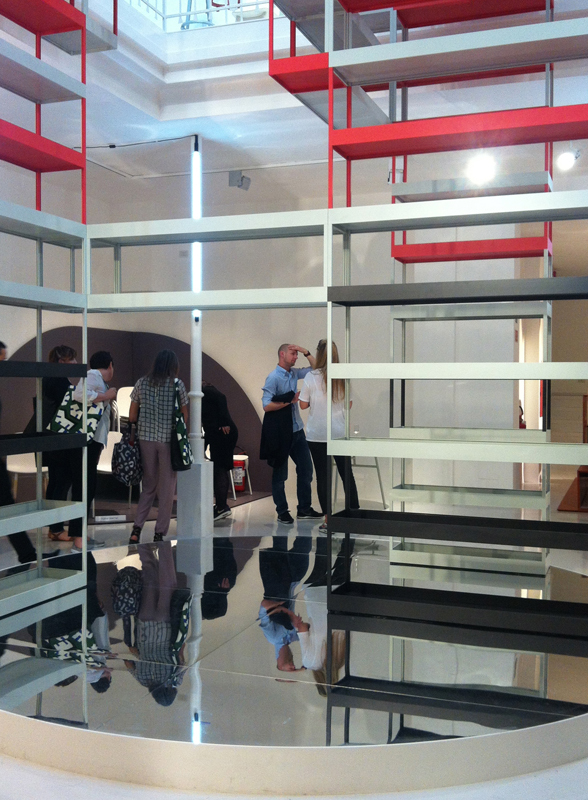 We can't quite believe it, but it is now two weeks since the Salone del Mobile - seriously, where does the time go? To re-live our wonderful time in Italy’s design capital, our MD Christian Hawley has chosen his top 10 products from the fair. Get in touch with us via social media and let us know if you agree with his choices! 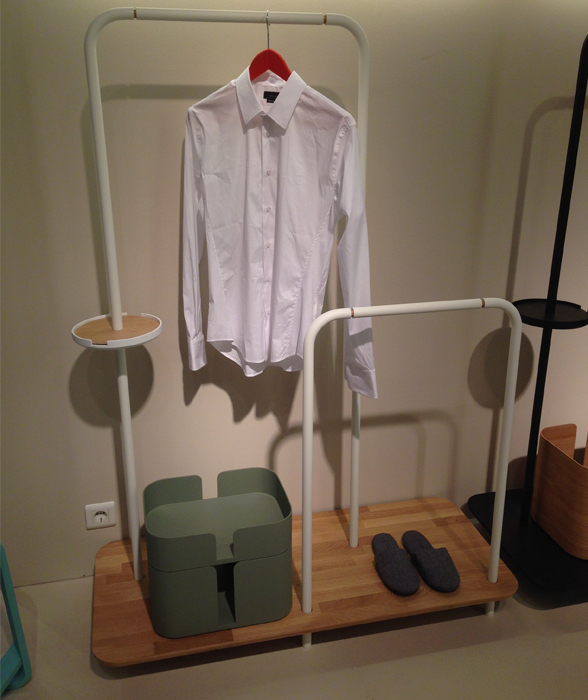 Topping the list is Punt’s brand new valet, Plateau, by Note Design Studio. Designed as a functional product to store outerwear such as coats and footwear, the Plateau aims to ‘create order in chaos’, whilst also maintaining an aesthetic appeal, according to Christiano Pigazzini of Note Design Studio. We love its effortless simplicity and striped-back construction. 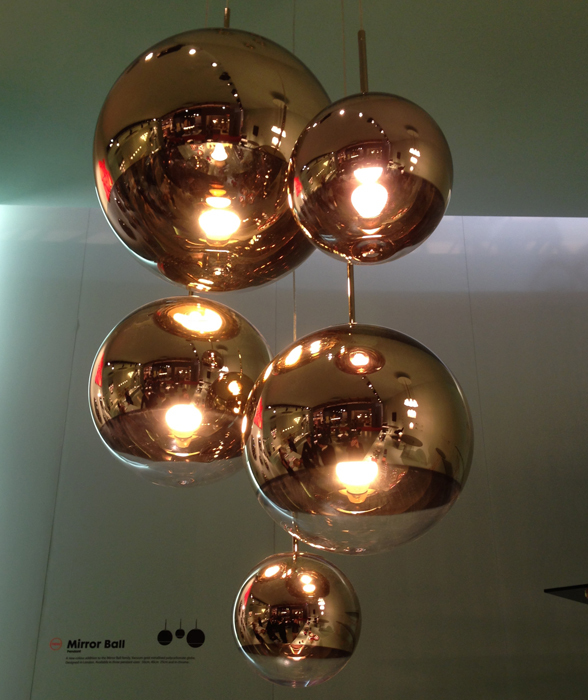 Tom Dixon released a number of new products this year, but the one that captured our attention was the release of the popular Mirror Ball in gold. This stunning classic had a contemporary makeover and looks all the better for it! We think they’d look beautiful hanging in clusters of three. Drawing on Mattiazzi’s expertise in woodworking, Ronan and Erwan Bouroullec have designed the Uncino chair for the Italian brand. The chair is made utilising two very different woodworking techniques – handcrafting and milling – which gives the chair character and personality. 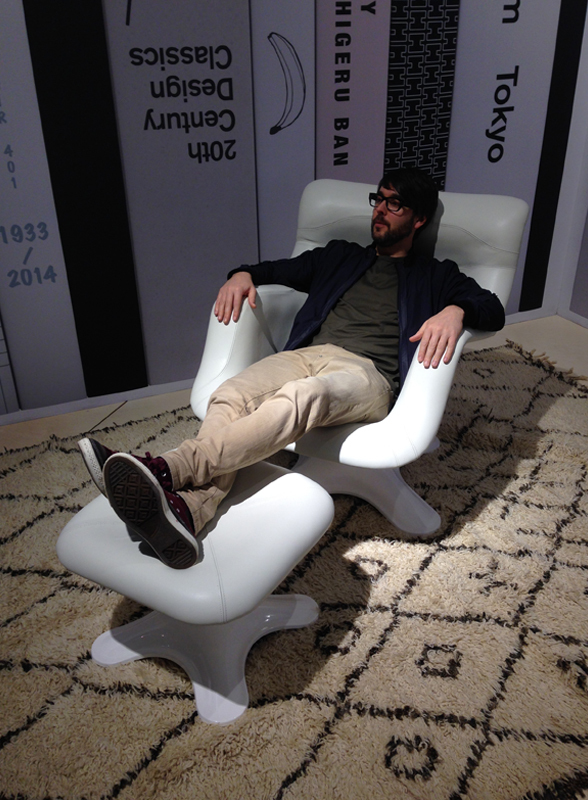 Uncino was shown for the first time at the Salone del Mobile and was received exceptionally well. We were especially struck by the chair’s unusual base and back and feel it is a real step forward in contemporary chair production. 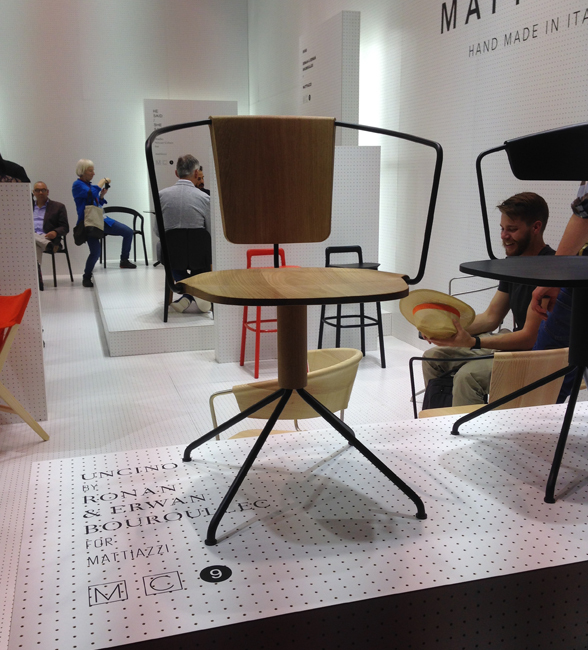 We all know and love Yrjö Kukkapuro’s 1964 classic the Karuselli chair so we were really glad to see it make a comeback at the 2014 Salone del Mobile. Re-released by Artek, the Swinging Sixties lounge chair was presented in all-white leather at the Finnish brand’s stand and looked phenomenal. 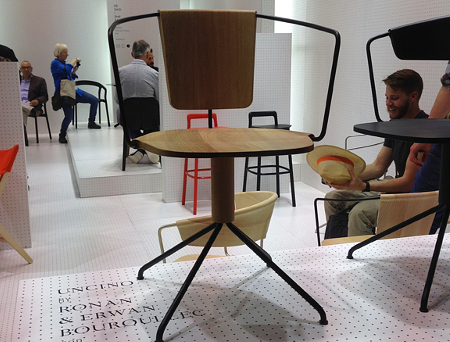 We adore this chair and its comeback is definitely one of our Salone 2014 highlights! Christian just couldn’t resist a sneaky sit down! Marble was everywhere at this year’s Salone – on tables at Vitra, Gubi and Moooi, on accessories at Lee Broom, Discipline and Bethan Gray and on lights and Normann Copenhagen and E15. 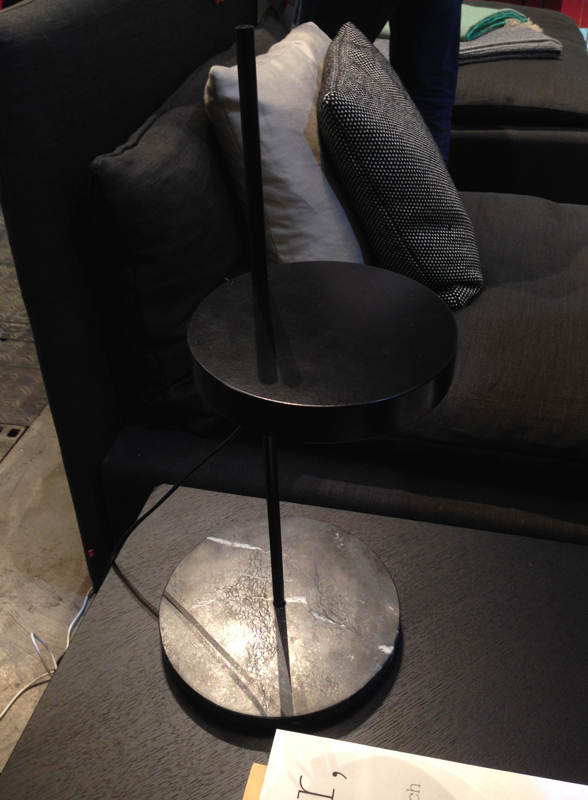 The luxurious material was the perfect fitting for E15’s new Palo lamp from Michael Raasch. Constructed from a circular marble slab base, slender pole and sliding circular light source, this really caught our attention for ingenuity and high sophistication. Its tactile design also delighted us – the moveable light source is a pleasure to use – and we can’t wait ‘til we can get our hands on one! 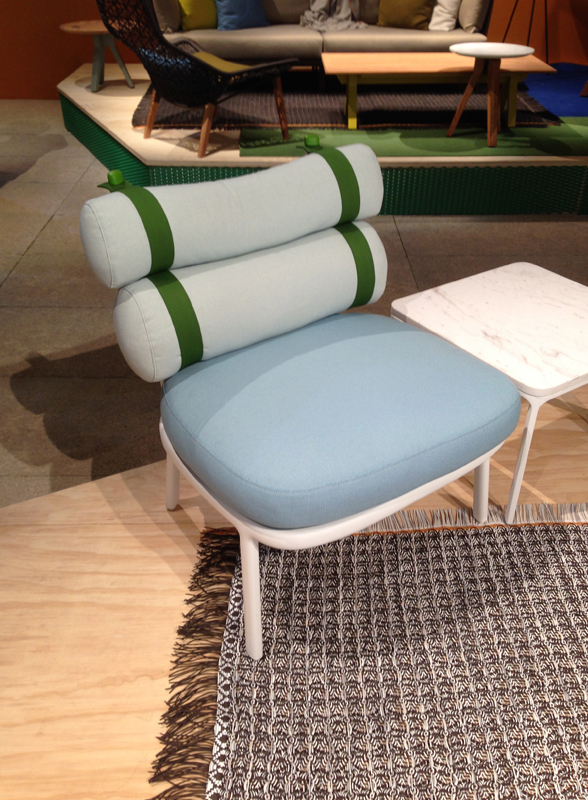 Outdoor specialists Kettal wowed us this year with a colourful stand and fabulous collection of new releases. Patricia Urquiola’s Roll Chair is our pick of the bunch with its simple aluminium frame, bolster cushions and colourful straps – we love the contrast. 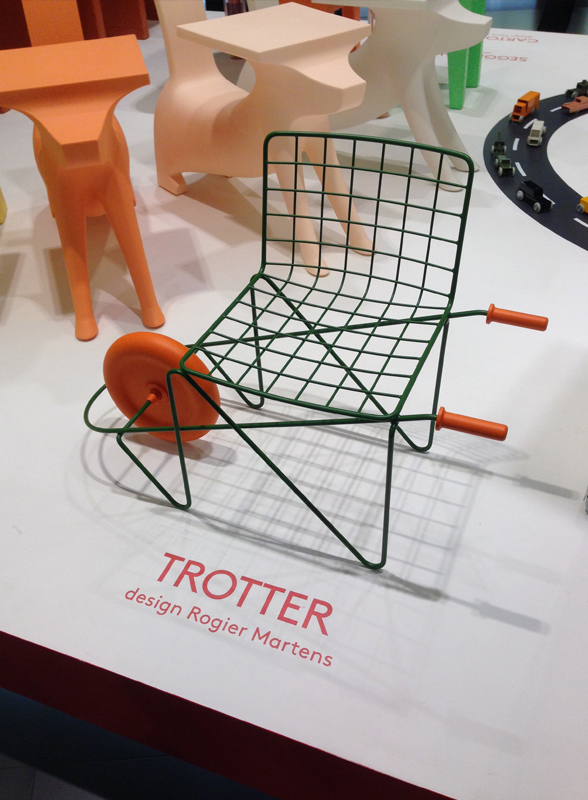 Not forgetting the kids, Magis’s Trotter Chair from Rogier Martens was another highlight at the fair. Designed to encourage children to be active, the wheelbarrow-style chair features a simple bottle green frame and bright orange wheel - allowing your little one to take their chair wherever they go! Storage is a key part of everyone’s home – especially in the digital age where smart TVs, DVDs, tablets, phones and all the cables that come with them, are in constant use - so we were really impressed with Stefan Diez’s storage collection for Hay. Called New Order, the collection is available in a variety of options, both open and with doors, to so you can tailor it to your needs. 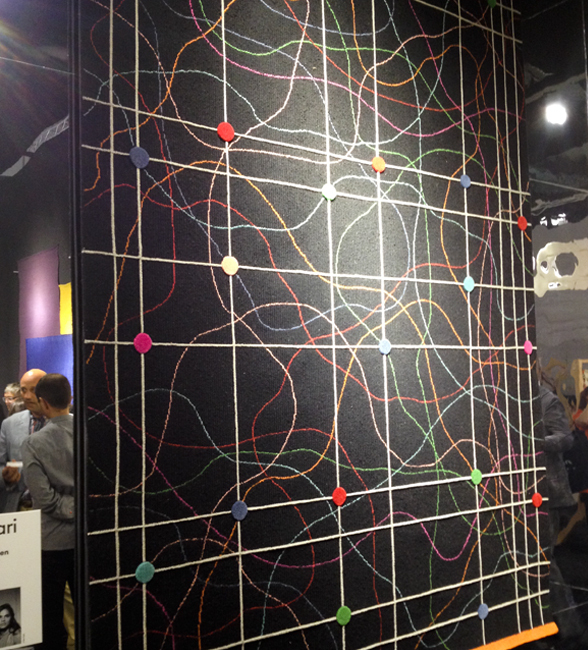 If you went to the fair, you’ll no doubt have noticed Nani Marquina’s impressive stand. Draped with colourfully patterned new rugs in all colours imaginable, it was certainly one not to miss. Doshi Levien's new collaboration resulted in the impressive gold embroided Rabari collection – the focal point of the stand – and we couldn’t get enough of it! 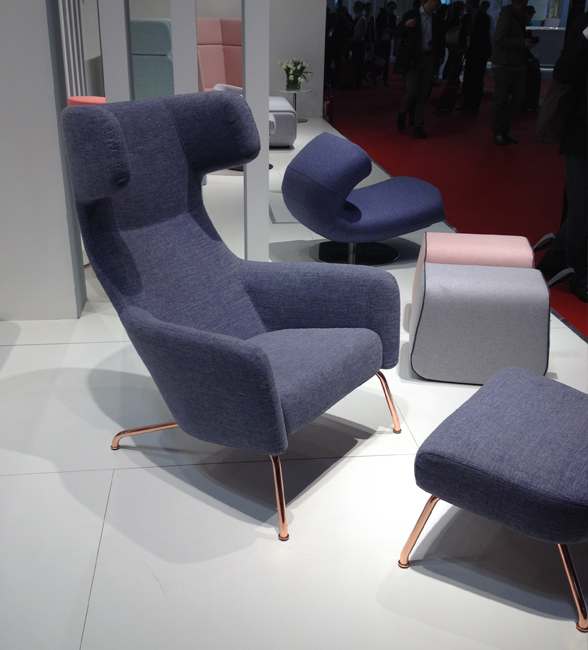 Last but not least we fell head over heels in love with Softline’s revamped Havana Wing Lounge Chair with copper-coated legs – a simple design that lets the detail do the talking. We’d love to know what you think of Christian’s selections – are there any you think we missed? Are there some you disagree with? Let us know on Twitter!